Hot Winter Special! $200 off weekly rate Jan 1 to March 1. WAS $1000 NOW $800! Comfortably furnished and fully-equipped Charleston-style boathouse overlooking the 17th fairway of the Ocean Creek Golf Course. Two minute walk to beach, two minute walk to the Marina Village which includes night life, pool, restaurants, and ship's store. *This home is perfect for families vacations and multi-couple get-aways. Fripp Island is a Nature Lover's Paradise with a Beautiful, Sandy Atlantic Beach & Miles of Biking and Walking Trails. Nature lovers won't need their binoculars as the deer, birds, and other wildlife will join you on your daily strolls. Up for a little more adventure than that? Rent mopeds, bikes & watercraft at the marina. We have been Fripp Island Lovers and Homeowners since 2001 and will be delighted to help you plan your Fripp Island vacation. We are also members of the Fripp Island Club--a private country club that features several pools, restaurants, TWO championship golf courses, tennis courts and planned nature, social and craft activities for all ages. Because we are Club Members access to this club is available (for purchase) to the renters of this home. VRBO does not allow for custom refund policy in their strict formatting, please see the attached rental agreement for ACTUAL refund/cancellation policy. We visited Fripp Island for the first time in 2000. We came back a month later and bought our first home here--this one! Simply said, we fell instantly, head-over-heels in love with Fripp. In the beginning we lived on the East Coast and were able to spend a great deal of time here. Eventually we moved to the mid-west and that first home became a rental. I enjoy the rental business so much--especially introducing First Time Fripp Island Guests to Fripp that we have over the years purchased 3 additional homes. 15 years later I still love what I do and I still have several guests from those early years that return to stay in my homes year after year. This home is located in a great area. It is just a short walk to the beach or the marina. All the other things Fripp Island has to offer are just a short golf cart ride away. It has a lovely view of the 17th fairway of the Ocean Creek Golf Course. I cringe to remember--when we purchased this home everything in it was green. The walls. The carpet. The countertops. The furniture. Everything in the home was green. Over the years we have done many updates. One of the first things we did was install hardwood floors in the living area and update the furniture. In more recent years we have added granite counters in the kitchen and 2 baths. We love the serenity of Fripp. There are unlimited things to do--if you choose to anything at all. Or you can choose to lay on the beach, or the deck, or at poolside and do NOTHING at all. Each of the two second floor bedrooms has a private bath. The first floor bedroom has a bath that is accessible from the bedroom or from the living areaa. 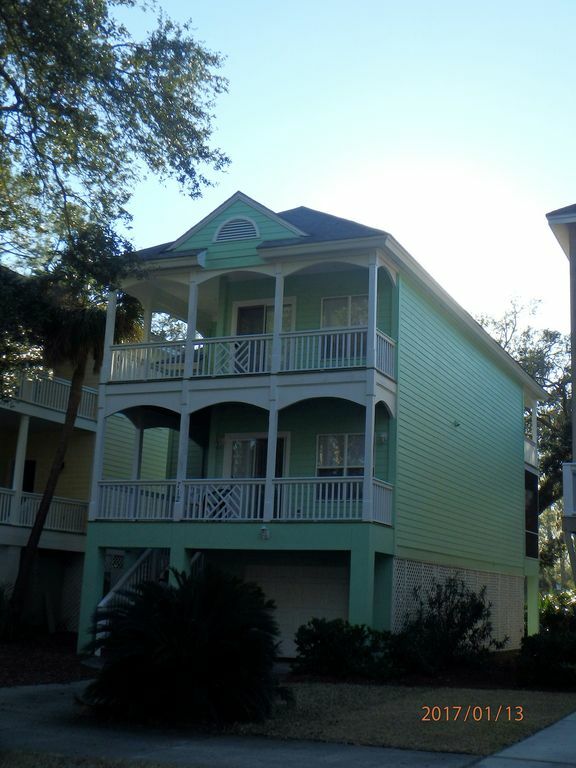 This home is located within the Fripp Island Resort. There is an additional charge to access the Fripp Island Resort and its amenities. Please inquire with homeowner if not familiar. This home sits directly upon and overlooks the 17th fairway of the Ocean Creek Golf Course. Property Owner's association limits the number of vehicles to 3 at any given time. NO EXCEPTIONS. Trailers and RVs are not permitted on the property. NO EXCEPTIONS. Fully furnished kitchen. Plenty of dishes, pots & pans and cooking implements. Open floor plan with dining table seating 8 plus 4 stools at the breakfast bar. Large television in living room. Televisions in all bedrooms. (4) Each bedroom has its own deck. Additionally there is a screened porch off the great room that overlooks the golf course. Home is located within the Fripp Island Resort. 2 golf courses, additional fee to access resort, additional fee to play golf. As with most homes on the island there is a full set of stairs to enter the house. Once inside the house there is a full set of stairs to access the 2nd floor. Home is located within the Fripp Island Resort. Guest must purchase access to resort in order to access pools. Thank you for being such great guests! We look forward to having your family return for your next vacation. Loved this location and the house was really nice. Would really like a vacuum handy for messes, but other than that the layout was great! Very rude and controlling owner. The house was nice. This is the reason I didn't give one star. The owners listed the house with a golf cart., Outdoor grill, with house amenities. Upon arrival we found a nasty looking old golf cart that didn't run and a gas grill that was also nasty and worn out. There was glass stopping up the garbage disposal in the kitchen. We were told that we could only have a certain number of cars in the gate. Never was a problem at any other rentals we had at Fripp. We were constantly hounded about things so much that we finally went around the house and documented other things damagesd or broken. Also cable TV and internet are extra charge. Keep all this in mind when you book. They actually came to the house to make sure we weren't smoking or had too many people. We don't smoke and never had more than the limit. We are a clean family and just wanted to enjoy a vacation but they tried to ruin it with their cheapness. Also, don't ask for a military discount, they are one of the few that won't give one. Be Leary. Could be a nice place if it had different owners. Perfect location!! We love Fripp. The house is very comfortable but needs a little updating. Propane tank empty and had to refill to grill. Easy accommodations! We spent last summer in this home and I'm in the process of reserving it again for this summer; We LOVE it! The location of the home is perfect for everyone! Our teenager enjoyed being centrally located in order to meet new people and hang out with friends; our adult child loved the short golf cart ride to the point for endless hours of fishing and swimming. My husband and I loved taking bike rides nearby and eating our morning breakfast on the back porch overlooking the golf course. The house is beautiful, the location is perfect, and the amenities are more than you could ask for at such a great price. We have spent the last 2 years vacationing in this home and we love it. Beautiful home in a fantastic location. The home itself is located just a few blocks from the beach on Fripp Island—with a terrific view of the 17th fairway of the Ocean Point Golf Course. Fripp Island is a fantastic place for vacations including all age ranges. From 8 months to 80 years—your entire family will enjoy this special place. Frpp Island is both a nature preserve and resort in one. Enjoy a morning walk on the beach and watch the Fripp Island Turtle Team scout for signs of new nests. The deer and birds are everywhere. And we do have our fair share of alligators. The Fripp Island Club offers resort amenities at their finest. There are two championship golf courses, a tennis club, several pools and restaurants to choose from. There is a fee for access to the Fripp Island Club and as owners we are proud to be Club Members with the ability to offer you this opportunity. Our beach home is located just outside beautiful Beaufort, SC. The Beaufort area boasts many art, dining and historical offerings. Savannah, GA and Charleston, SC are each just a bit further away and make excellent day trip excursions from Fripp Island. These cities also have the closest commercial airports. We are also convenient to the Parris Island Marine Corps Recruit Depot. We are proud to offer a discount to the families attending their loved-one's Marine Corp Graduation. Resort fees NOT included in rates. Cleaning fee required for stays of 3 nights or less. 2018 Rates do not include golf cart Security deposit generally refunded on or about the 15th of the month FOLLOWING the check out date.